This is the error I am getting when trying to load my game on 4/25/16. Please help! I'm having the same issue but I don't know how to fix it. Yea I have the same thing too. I have tried everything to uninstalling the game and restarting it and nothing. Me and my friends were trying to have a race to see who could beat first and I was in the lead. I'm new to the game and have put around 24 hours in when the same thing happen to me. Is there like a way to load up an earlier save or something? I don't mind losing some progress but I definitely do not want to lose my entire save and start over again. yo is anyone plan on helping me?????!!!!!!!!!! devs i spent money on this game and i love the game but when i lose over 2 days of game progress i get pissed please someone REPLY!!! Same issue here Xbox one user. Header checksum illegal. Try again? I would assume this would be maybe a pirate protection malfunction. By that, I mean a protection against illegal copies. A bug must have caused some Xboxes to show this even on legit copies. God can't help us anymore! Burn all the bridges and fire in the hole!" fair enough, not had opportinty to check the whole forum. Are you aware of any fix at this point? only bought the game yesterday tbh so not a huge issue, just unfortunate. The only fix I can currently come up with is do a full re-install or attempt to contact the UWE team by email. How do you get the idea that broken save games are caused by anti piracy measures? You already came up with that idea in another thread, but unless some of the developers said something about issues with any anti piracy component I think this is a very far fetched assumption. Simply I came up with the conclusion because it appears to be checking some kind of value, the Header Check. The sum of the value adds up to an illegal number, clearly indicated by the error. I presume this could be because if the value does not add up correctly, it could mean the game is considered pirated. I don't fully understand it, but i'm trying my best to help. 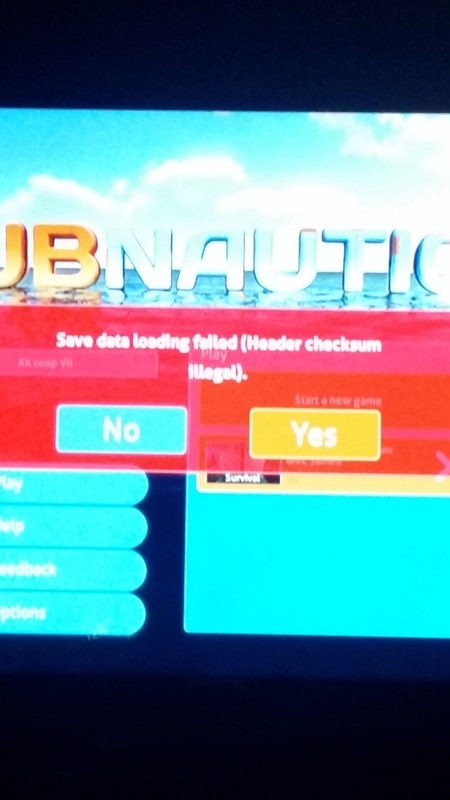 This happened to me too on xbox one i dnot know how to fix soo could anyboduy help me how to? I dont want to lose my progress cause i worked so hard on it! @BekaTMG , the last time you saved the game did anything abnormal happen? Something that may have interrupted the saving?